Finding and listening to your favorite music is one of the most popular things to do with the Assistant on Google Home. It’s always been a great speaker—and now it plays more tunes with new services from Deezer and Spotify, along with cool new ways to play and find your favorite music. First on the mic is Spotify Free— rolling out this week in the US, UK, Canada, Australia, France and Germany you can add a Spotify Free account to your Google Home. It’s easy to sign up and you can do it right in the Google Home app. With a simple “Ok Google, play Today’s Top Hits” you’re off to explore fresh jams and deep cuts. Next up, your music. Do you have tons of songs on your phone? Don’t fret, with Bluetooth® Audio you can now stream your favorite songs from your Android phone, iPhone or other Bluetooth-enabled devices. It’s a great way to enjoy even more music on Google Home. You can also get help from your Google Assistant when you’re looking for just the right tune, and you can have fun doing it. Try this: describe your favorite album artwork, maybe the one with the baby in the water or the four guys walking across the street in London. Or maybe you only remember a few of the lyrics of a song. Just say “Ok Google” and then share what you do know. Either way, your Assistant can name that tune and start playing it. 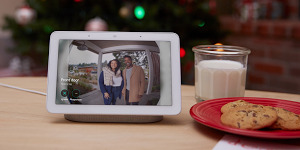 And Google Home has a multi-room feature, letting you enjoy the same song in every room by grouping any combination of Google Homes, Chromecast Audio or Chromecast built-in speakers together. Google Home users in Germany and France are already using Deezer, and pretty soon those of you in the US, UK and Canada will have that option too. In addition to Deezer and Spotify, you can stream music from Google Play Music, Pandora, YouTube Music and 100+ Google Cast-enabled audio apps.